Growing up in California, my brother & I made our 1st visit to Louisiana when I was 10 years old. Our grandfather took us all over Louisiana to show us all the history that ran through our state’s borders. At 12 years old I moved her permanently with my family & instantly had a deep love for the culture & history of New Orleans. Being a busy working mother means time is so vital to our family. My kids are getting older and we have a very busy schedule but that doesn’t mean we can’t block off a few hours to learn more ab out Louisiana and give my children the same love for our culture and history that my grandfather gave me. 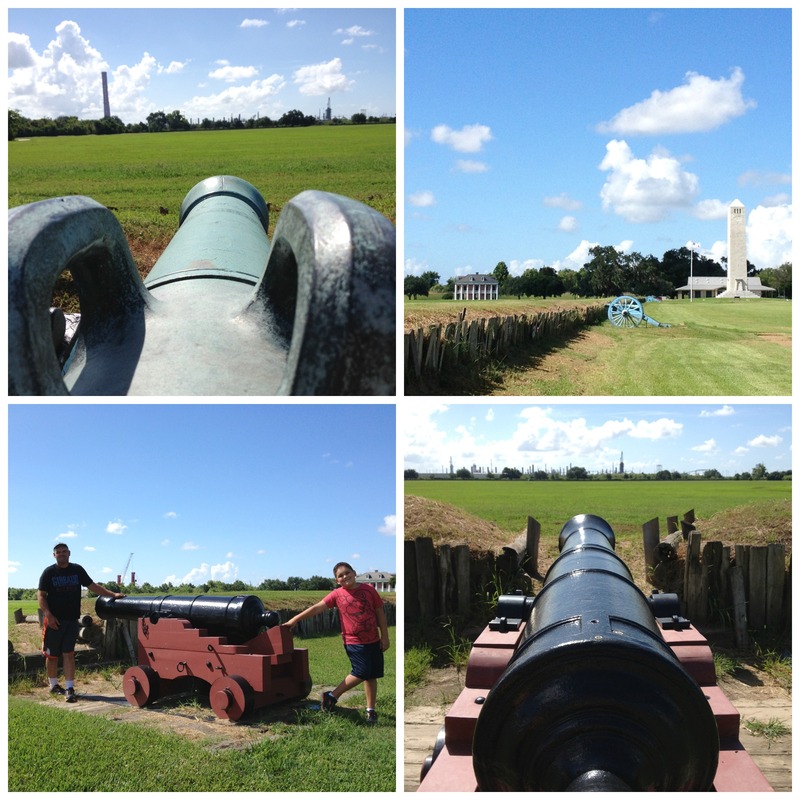 This week we visited Chalmette Battlefield. Chalmette is a very short drive from my home and perfect for a Saturday morning day trip. The Chalmette Battlefield, National Cemetery & Visitor Center is roughly about 7 miles downriver from the New Orleans French Quarter. If you have ever taken a riverboat cruise with your family you can see the battlefield from the riverboat. Both the Chalmette Battlefield & the National Cemetery is a historic site monument to two of the most significant wars in U.S. History, The Battle of New Orleans which led to the ending of The War of 1812. I haven’t visited the Chalmette Battlefield for quite sometime but I thought this would be perfect for my family who enjoys history and understanding how important New Orleans as well as Louisiana was to our Nation’s growth & prosperity. Recently our area has been performing restorations to our local historic sites. 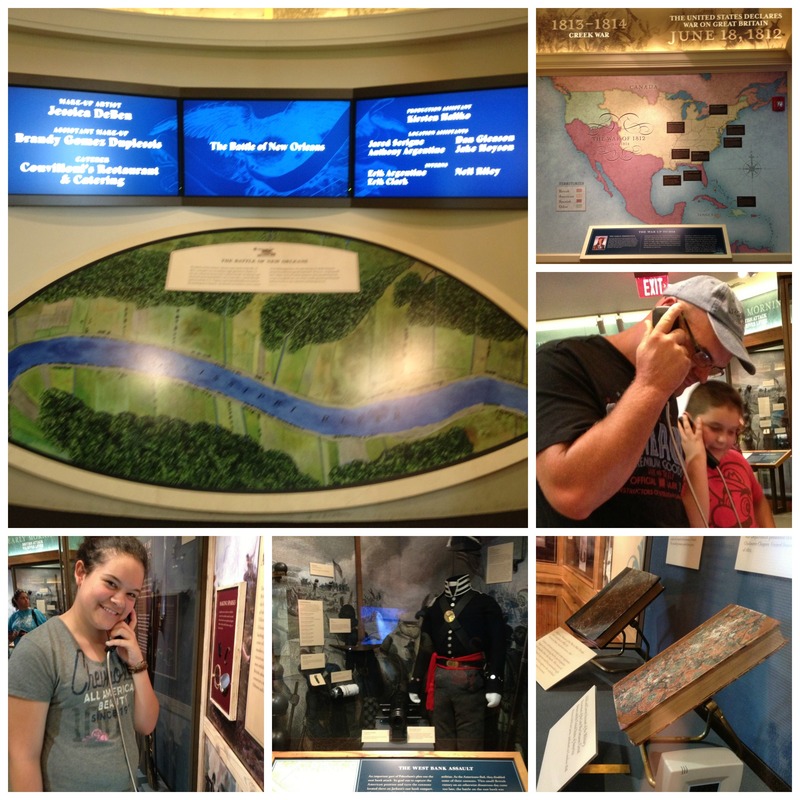 Jackson Barracks, Fort Pike and other areas have already had major restorations so I was looking forward to experiencing something new with my family. My almost 9 year old loves to learn about battles that took place locally. Personally, I think he is like most boys and enjoys looking at the cannons. My husband is great about giving our son a play by play of what may have happened during the war. Where were the British coming from, why the cannons were placed there and so on. I guess dads love cannons and battlefields too! When we arrived to the visitor center we were surprised by the new modern look the center had. There is a small 2 room museums that started with a short video on the Battle of New Orleans. The video was interesting and fun. In fact, we walked in and the video was already playing for a few other guests which we watched then my son wanted to watch the video again from the beginning. Aside from 2 videos in 2 different areas, the museums was other forms of multimedia information like an audio history lesson that my family enjoyed. It was nice that the museum encompassed video, audio and standard museum offerings. It make the museums interesting and kept my children wanting to learn more about the Battle of New Orleans. The Battle of New Orleans occurred in 1814–1815 which was also the last battle of the War of 1812. By ending the War of 1812, England failed to regain control of the American Colonies, lost during the American Revolution, the War of Independence. General Andrew Jackson, Jean Lafitte and his men as well as other volunteers defended New Orleans from the British. I explained to our children that had the British gained control of the mouth of Mississippi River at New Orleans, our country may not have survived more battles as the British would have fought their way along the entire Ms. river and forced the port economy to hault shipping and distribution (as well as taken lives) which in turn, would hurt U.S Economy and out Country in a whole. The Malus-Beauregard House was built about 18 years after the Battle of New Orleans & is named for its 1st & last private owners. The property on which the house was built was subdivided from the original Chalmete Plantation by the St. Amond brothers and sold in 1832 to Alexandrew Baron. Baron was acting on behalf of his mother-in-law, the Widow Malus, nee Madeleline Panneteir. The Widow Malus. In 1880 Judge Rene Beauregard, son of Confederate general P.G.T. Beauregard was the last private owner of the Beauregard House. It stayed in his family until 1904 when it was sold the New Orleans Terminal Company then acquired by the National Park Services in 1949. We were able to go into the unfurnished 1st floor with my kids and then walk onto the levee of the Mississippi River. Adjacent to the battlefield is the United States Civil War Chalmette National Cemetery. The cemetery is honors Civil War soldiers (both Union & Confederate) who died on both sides. It is also where 4 Battle of New Orleans soldiers rest in peace. The cemetery sits on a tract of land which is approximately where the British artillery was located during the Battle of New Orleans. The U.S. Department of Veterans Affairs website has searchable databases for all soldiers buried here and is maintained by the National Park Services which is also opened to the public. Visiting with my children was great idea! If you are every in then area, this is a perfect spot for a picnic lunch (leave ice chest in your vehicle) due to the numerous Oaks, picnic tables and outside bathrooms on the property. If you are taking the Creole Queen, the riverboat docks at the Chalmette Battlefields everyday at 2:30 everyday. There you can use the bathroom, visit the museums and do a walking tour as I did. Also, the park ranger hosts an informative chat with visitors to learn more about the Battle of New Orleans and the structures on property. Visiting is free of charge and a great way to spend the afternoon. Learn more about Chalmette Battlefield, The United States Civil War Chalmette National Cemetery, The Malus-Beauregard House on the park’s website. Your photos really bring life into the lesson. My husband loves all the war and battle history if we ever make it down that way we will have to visit. Such great pictures!! I love learning about history. My kids would enjoy a tour like this. Thanks for sharing! It’s so great to get out and learn about local history. This looks like an outing your family really enjoyed! What beautiful photos! I love learning about local history and hope to pass it the interest on to my son! We visited here too during our recent trip to Louisiana and it is a fascinating place for sure. When we got there the buildings were closed but they said it was okay to walk around so we didn’t get to see inside and I regret that. That is one Louisiana destination that I have never been to… I have heard good things about it though. Thanks for sharing your journey. Glad to connect with a fellow Louisianan!